If you’re looking for beautiful new truck that can handle even the toughest jobs, look no further than a rugged Toyota Tacoma. At Oxmoor Toyota in Louisville, Kentucky, we have a stunning selection of new Toyota Tacoma trucks to choose from. Known for their bold appearance and world-class reliability, the Toyota Tacoma is simply one of the finest trucks on the road today. 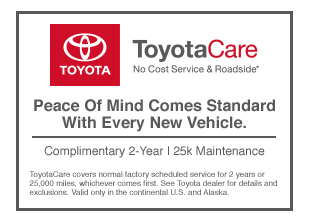 If you have a question, call us now or come visit our Louisville, KY Toyota dealership for a test drive to remember. Disclaimer: New vehicle pricing includes all offers and incentives. Tax Title, Tags, Dealer, and $748.75 Document Fee not included in vehicle prices shown and must be paid by the purchaser. While great effort is made to ensure the accuracy of the information on this site errors do occur so please verify information with a customer service rep. This is easily done by calling us at (502) 565-0086 or by visiting us at the dealership. **With approved credit. Terms may vary. Monthly payments are only estimates derived from the vehicle price with a month term % interest and % downpayment. Finding the perfect new car, truck, or SUV is easy when you shop at Oxmoor Toyota. You can browse all our new Toyota vehicles and used car inventory on our site. You can check out the Toyota Tacoma vs. Toyota Tundra in head-to-head competition, and then take a look at all our most popular new car models side-by-side at our model lineup page. Finally, you can research our awesome factory offers at our offers & incentives page. If you’re not sure whether buying vs. leasing makes sense for you, get in touch with the friendly folks in our Louisville, KY auto finance center today. We’re experts at helping people with all kinds of budgets and credit situations get behind the wheel of a great new car. And you don’t need perfect credit either. Give us a call today, or fill out our secure online auto finance application to get pre-approved for auto credit from home.